I originally wrote this recipe using beet juice. Recently though, I haven't been juicing so much ... I think it's the mortal fear of having to wash the various implements involved. But I do love the idea of integrating more beetroot (aka beet, for you North Americans) into my diet and my family's. Which is a challenge, because Robbie detests it. Almost as much as blue cheese. But beetroot has this amazing synergy when it's mixed with chocolate, or cocoa powder ... making something utterly, indescribably good. Hence, this smoothie was born. This is the new, revised, juicing-free version. Nowadays, I roast leftover/surplus/hanging-around beetroots in olive oil in the oven until they're caramelised, let them cool, and blend them with yogurt. This makes an amazing dip, but can also be chucked into smoothies, cakes, pancakes, muffins, and so on. *Very* handy. Make up more than you'll need for this recipe! 1. If you're making extra beetroot yogurt, do that first in the blender. 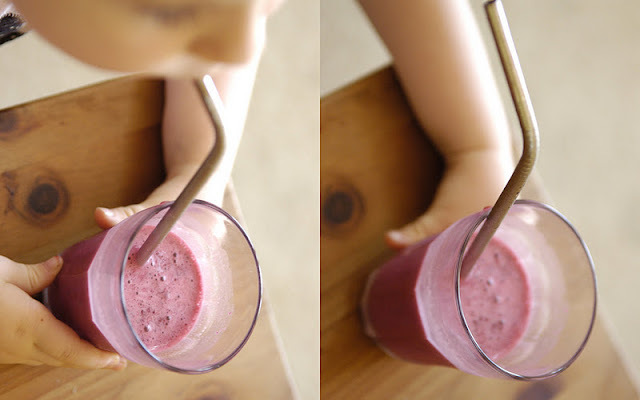 Take out the extra and pop it in the fridge, leaving just enough for this smoothie recipe. 2. Otherwise, just add all the ingredients to the blender and blend. NOTE: Don't forget to make any extra smoothie into popsicles! "It's not beetroot unless you can taste it." Our smoothies were 100% organic. I usually get my beetroots at the farmer's markets - use up the greens in some kind of garlicky dish and then play my tricks with Robbie. But this latest batch, I grew! I pick up bananas on special and freeze them. (TIP: if you live in Brisbane, check the freezer at Wray Organic!!) I estimate these smoothies come out around $1 each. Happy! My mum and I were just talking on the phone a few days ago about trying out beetroot in a smoothie! Your's look wonderful. Such a great idea! That smoothie does look amazing! I think your Robbie and I are related somewhere along the line! I have never liked beets nor blue cheese! I do like the look of this smoothie though and really should try it before saying *uck*. Love that your little one is enjoying it. Belle, What a sweetheart you are! Hope you enjoyed your coffee and perusal! I just tried a variant of this - used low-fat plain kefir as the base, 1/2 frozen banana and some organic cocoa mix (so has some sugar in it). Added a dab of vanilla and a dash of cinnamon and it is DELICIOUS. I'd never tried beets + chocolate, but now I am hooked.